Yes, I am eating fruits now but I am careful about which fruits I consume because some fruits have a really high sugar content and I try to keep my natural sugar consumption under 20 grams a day. The reason being that the more sweet stuff I consume, the more I tend to want sugar. It is a vicious cycle and if you are new to quitting sugar, I would suggest that you keep that natural sugar intake low as well. These berries are high in fiber and low in sugar plus they are extremely flavourful. Packed with nutrients, avocados can help to lower blood pressure and control your cholesterol levels. I am not a fan but they pack a nutritional punch. High in Vitamic C and rich in antioxidants, papayas also contain a lot of fiber, which can help to slow the release of sugar into the blood and assist with digestion. 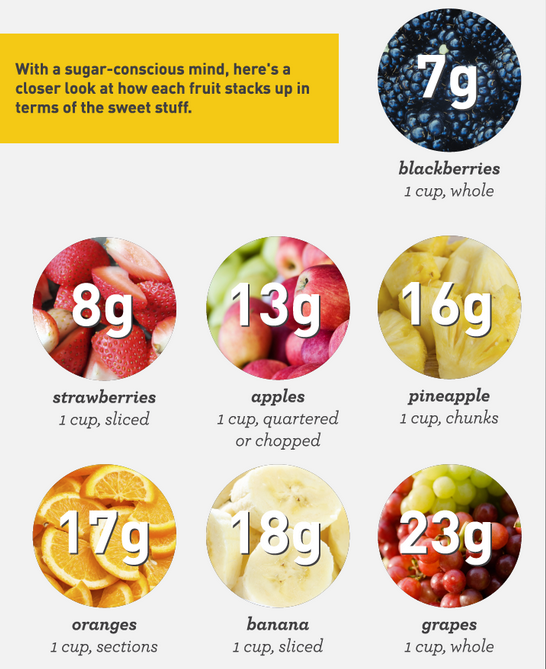 Only fruits are low in sugar, not juices and desserts that they are used in. Reason being that one glass of orange juice has at least 3 oranges in it, which is 51g (3*17g in individual orange) of sugar!